As the drum box application stands, there is only one song per project. The concept of a project is used to simplify the use of the application. A project contains all the patterns, the song, the tempo. The concept of the project is to encapsulate loading, saving, deleting and copying all this information in one big chunk. Below the title, the current project's name is displayed. All changes carried out to patterns, tempo, song play order are automatically saved in the current project. 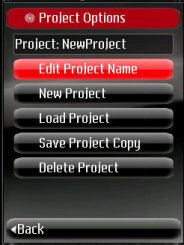 Edit Project Name allows the project's name to be changed. New Project creates a new project. Load Project loads an existing project. Save Project Copy, saves a copy of the current project, the copy becomes the current project. Delete Project allows a project to be deleted, it is not possible to delete the current project.